Sallie Mae is best known for student loans, but that’s only a small portion of what the company offers. While most of its products are tailored for those saving for college, anyone can open a Sallie Mae money market account, various savings accounts, certificates of deposit and more. You won’t see the highest interest rates when you save with Sallie Mae, although it does outperform some large banks. Sallie Mae Bank lacks physical locations, so your access will be limited to online, mobile and over the phone. Founded in 1973 as the Student Loan Marketing Association with the nickname, “Sallie Mae,” it started off as a government-sponsored enterprise designed to support the government’s student loan program. In 1987 after years of growth, Sallie Mae became publicly traded on the New York Stock Exchange under the symbol SLM. By 1987 the company owned 24% of all outstanding student loans, and serviced over 2 million accounts. Sallie Mae parlayed into college savings, rather than just lending in 2006 after an acquisition of Upromise, a saving-for-college company. Continuing down the route of more banking options, Sallie Mae expanded its saving and planning options with the addition of retail banking products in 2011. Initiatives include FDIC-insured high-yield savings accounts, CDs, checking accounts, money market and credit cards. In 2014 the company split into two companies: Navient, which services federal loans for the U.S. Department of Education, and Sallie Mae Bank, which offers retail banking. Both entities are publicly traded on the stock exchange. The company's homepage is seen above, with a number of financial options to choose from. With Sallie Mae, you can find help and services from student loans to college savings to standard banking accounts. If you choose Sallie Mae as a place to stash savings, you’ll have a wide variety of choices. While most of the offerings are aimed at those saving for college – parents and children alike – anyone can open an account with Sallie Mae. Choices include money market accounts, several options for savings accounts, CDs and 529 college savings plans. Looking for a decent interest rate for your savings account? Sallie Mae advertises rates above the national average for its High-Yield Savings Account. Unlike some banks, with a high yield savings account at Sallie Mae you won’t have a different interest rate depending on the size of your deposit. It’ll be the same if you have $1 or $100,000. You can open an account with any amount of funds, even none at all, but if you want to start earning interest, you’ll need to deposit some money into the account. Savings accounts are one of the easiest and most accessible places to store your money. You can withdraw or transfer funds up to six times per cycle without penalty, according to Federal Reserve regulations. With Sallie Mae online savings, you can link an external bank account to make the process simple and fast. 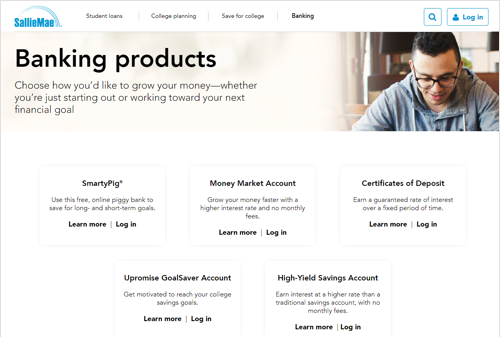 In addition to high yield savings accounts, Sallie Mae also offers the SmartyPig account that’s described as a “free FDIC-insured online piggy bank that helps you save for long- and short-term goals.” With this type of account, you’ll earn more interest once you bank more than $10,000. You’ll get to set specific goals and deadlines for whatever you’re saving up for. You can have multiple goals, such as savings for a new car and for a vacation. Or, you can just have one – it’s up to you. To help your progress toward your goals, you can set up monthly or biweekly auto deposits. You can also earn $10 for every friend that opens a SmartyPig account and sets a goal. There are no fees to open or use a SmartyPig account. One of the best ways to earn interest using Sallie Mae Bank is through its money market accounts. With interest rates generally higher than savings accounts, it may be a better choice for those looking to save up some cash. You’ll get free transfers and a maximum of six withdrawals per month, which is the same for Sallie Mae savings accounts. Where the money market differs is that you can write checks from the account, which can be useful if you have money in the account earmarked for a big purchase. You won’t have to transfer it to a checking account in order to write a check. With no minimum balance and no maintenance fees, you get all the same benefits as a savings account but with more interest. Update: Sallie Mae does not currently offer this product. The Upromise GoalSaver product is a savings account marketed toward those saving for college and related expenses. Similar to the SmartyPig account, you can set one or several goals, and track your progress along the way. You can set automatic deposits, and make withdrawals up to six times per billing cycle. Unique to this offering is the cash rewards program. You can earn a 10% annual match on your Upromise earnings, but you have to link a GoalSaver account to a Rewards Account and make 10 transactions within 90 days. You also have to keep $5,000 or more and maintain an average daily balance of at least $5,000 to be eligible for the match. Sallie Mae's Upromise GoalSaver Account offers smaller rewards as well, such as a $10 annual bonus that you can receive after 60 days of the completion of a year since your account was open. You’ll have to have a recurring deposit post 10 out of 12 months (with at least $10) to receive this bonus. That’s not all for bonuses, there are a few other ways you can earn cash rewards the longer you keep your account open. The idea behind the cash rewards program is to help new savers learn good habits by providing incentives and rewards within the account. You won’t earn as much interest with this account compared to SmartyPig, high-yield or money market accounts, but you can earn small bonuses through the rewards program. Sallie Mae’s Upromise 529 Plan is a way to save for your child or your own education expenses. You can open this type of account with anyone (not just your child) as a beneficiary, as per plan rules without being penalized. A 529 is considered a tax-advantaged way to save for college expenses. Contributions are limited to a certain amount each year, and those contributions grow tax-deferred in the account. The SSGA Upromise plan lets you choose a simple age-based option or a whole range of individual portfolios for how you want your money invested within the account. Your contributions can be withdrawn for qualified expenses at any eligible school in the U.S. or abroad. This includes two- and four-year colleges, as well as vocational schools. Money from the account can be used for tuition, fees, books, technology and more. You’ll only incur tax penalties if the money is used for non-educational expenses. One of the advantages of 529 plans is that they can have less of a negative impact to financial aid packages compared to other accounts, such as a trust or custodial UGMA. Fees No transaction fees, but there are penalties if you choose to withdraw from a CD prior to maturity; also a $5 returned deposit fee. You have even more savings options at Sallie Mae bank. You can choose from 11 different term lengths for a certificate of deposit (CD). A CD is another savings method, though it’ll make your money a little less accessible. It’s not as easy to withdraw money like the savings account options listed above. With those, including money market accounts, you can withdraw funds up to six times per monthly statement. CDs on the other hand lock your money up for the term you choose, so that you can earn the promised interest. If you absolutely must withdraw the funds prior to the term limit, you’ll pay a termination penalty. At Sallie Mae, the lowest amount of money you can open a CD with is $2,500. You can pick a CD with only a six-month term, or you can pick a length in between, up to the maximum of 60 months. The longer the term, the higher the interest rate. This means, if you want to earn the most amount of interest, you’ll want to be prepared to stash that money for more five years. One thing to note with CDs, is that you can’t add funds. Unlike savings or money market accounts where you can add money every month, or multiple times a month, your CD is funded once during the initial deposit. That means your deposit is final when you open an account. As for interest, your money will earn interest each month which you can access. You can choose to receive interest disbursements monthly, quarterly, yearly or at maturity. The money will be sent electronically to an external bank account you link. You’ll have to fax or mail a form to set up the disbursement. Once the CD reaches its term limit, you have a 10-calendar-day grace period where you can withdraw the funds. If you choose not to, the CD will automatically renew. That means, your money gets locked in again, usually at a different interest rate as the rates will increase or decrease each year. Where Can I Find Sallie Mae Bank? Sallie Mae Bank operates as an online bank. You can use the website, mobile app, phone number or mobile text banking to access your account. The mobile app is secure and offers e-deposits for certain qualifying checks, which eliminates the hassle of mailed checks. Mobile texting is available for high-yield savings, money market accounts and CDs. The service allows you to text commands such as, “LAST” to get a list of your most recent transactions, or “BAL” to see account balances. This might be useful if you’re in an area with limited data usage that lacks internet access. For phone contact, you can find number listed under “Contact Us,” on the website. Upromise products have a different phone number than Sallie Mae Bank products such as CDs, money market accounts, and high yield savings, so you may need to use multiple numbers if you have several different accounts. What Can You Do Online With Sallie Mae Bank? As an online-housed bank, you can complete every transaction remotely. Open accounts, send funds, withdraw money, monitor savings, you’ll have access to a number of options online. 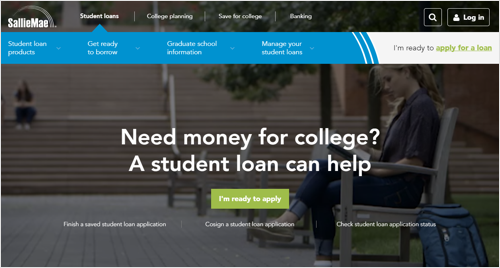 Sallie Mae's specific banking products can be seen in the accompanying image of its website. On that page, you can get a feel of each banking account to determine which one(s) could be right for you. You have the option of logging right into your account or learning more about each if you need. Most banking account actions can be done online, but there are a few times where you’ll have to call. Sallie Mae will have that annotated on the site if that’s the case. One example is CD interest disbursements. For those, you’ll need to print and fax or mail a payment form. Unlike some banks, you can deposit checks through the mobile app, which is a huge timesaver. Otherwise, you’d have to mail checks in and have to wait for processing and mail delivery in order for your money to deposit to your account. The app gives you mobile accessibility so that you can keep on top of your savings, even while on-the-go. The easiest way to access the money in a Sallie Mae bank account is through an electronic transfer, called an ACH transfer. This type of transfer takes two to three business days and is free. You can link external bank accounts for this type of transfer. It’s the easiest way to deposit or withdraw money from your Sallie Mae account. You won’t be issued an ATM card with any of the Sallie Mae accounts, as it’s rare that banks issue cards for savings accounts. However, you will have the option to write checks with a money market account, which can be an added bonus. If you need money wired, which is a quicker process than an electronic transfer, you will be charged an outgoing fee of $20. Incoming wire transfers don’t incur a fee. You can view your money at any point online or through the mobile app, and if you don’t have readily available internet access you can call or use the mobile text banking service. You won’t be able to visit a physical location with this bank, but you have multiple points of access to your money. At any time, you can withdraw money from your savings or money market accounts. You have the option to withdraw or transfer funds up to six times a statement cycle. The six transaction limit is not imposed by Sallie Mae, but by the Federal Reserve and it applies to all savings accounts. If you want access to your CD, you can withdraw interest payments at any time, penalty-free, but you can’t withdraw the initial deposit prior to maturity without getting penalized. Once your CD matures, which means it reaches the term expiration, you can withdraw the funds during a 10-day grace period. If you miss that window, you won’t have access to the money for another term. It will automatically renew. How Can I Save More Money With a Sallie Mae Savings Account? When considering the impact of a savings account, it’s important to total what money you have sitting around in a checking account or in cash, or both. You don’t earn interest with most checking accounts, and you certainly don’t earn interest with cash on its own. While you might not think the interest rates are high enough to make an impact, you can do the math to see that it does. The longer you put your money away the more you can earn with interest, so it’s important to start sooner rather than later. Additionally, Sallie Mae advertises higher than market rate interest rates, so you stand to earn more than many average banks will earn you. If you’re wondering if a savings account will earn you more than an investment account, such as a taxable brokerage account, it probably won’t depending on the market. However, you’ll have easy access, FDIC-insured funds (investment accounts aren’t insured by the FDIC) and risk-free interest. The biggest risk is that interest rates go down, not that you’ll lose your money. So if you have a long-term goal such as saving for college expenses, perhaps an advanced degree or even something personal like a family reunion or wedding, opening an account and stashing money in it will earn you more than having it sit in a non interest yielding place. What’s the Process for Opening an Account With Sallie Mae Bank? All you need to do is make your way to Sallie Mae’s website to open an account. Once you've found which account you'd like to open, there will be an "Open an account" button on that account's page. When you click that, you'll be brought to the page shown here, where you'll begin the application process by giving your contact information. You also have the option to call if you prefer speaking to a customer representative. Either way, you’ll need personal information to open an account including Social Security number, date of birth and a number of other pieces of personal data. If you’re linking an external bank account to fund your initial deposit, you’ll need the account and routing number. You’ll choose which Sallie Mae or Upromise account you’d like to open, and you’ll input the necessary information. Most of the savings accounts have no minimum deposit to open an account. For other accounts, you will need at least $2,500 to open a CD, and $15 for a 529 college savings plan. All of those accounts can be funded with an electronic transfer. To link an external account, you’ll provide the necessary account information and then wait for micro-deposits into your account. Once you verify the amounts (less than $1), your account will be linked. This means you can withdraw or deposit funds using the external bank account linked to your Sallie Mae account. Once you’ve signed up, you can access your account online, through the mobile app or via the phone. The biggest catch, and this goes for all savings accounts across most banks, is that you’re not guaranteed to have the same interest rate you signed up for. What this means is that it may seem like the best place to start stashing money, as the savings and money market accounts have competitive interest rates. However, those rates are always subject to change. You can find that disclaimer on most savings accounts. It can change in a few months or weeks or years, depending. However, you do lock in the interest rate for CDs, so that’s the exception to the rule. But the downside with Sallie Mae CDs is the high minimum deposit. The minimum is $2,500, which is more than what many other banks require. Some banks will have $1,000 minimum and others won’t have a minimum at all. While you stand to earn more interest on higher deposits, it may be a barrier to entry for someone with less funds to part with for a CD. The savings accounts are all available with no minimum deposit or balance, which is a better option for new savers. Accounts are FDIC-insured, barring the 529 plan as that’s considered an investment account. Which brings us to the benefit of this online lender: college savings plans. Not all online savings banks have this option, and it’s a nice product to offer for those trying to find tax-advantaged savings. That said, Sallie Mae Bank doesn’t offer custodial UGMA/UTMA accounts, which are other options for adults to save for a child. This type of account doesn’t have to be used for educational expenses like 529 plans. Lastly, if you’d rather do your banking in person, you won’t find that with Sallie Mae. The financial institution operates online or over the phone. You’ll never have the opportunity to sit down with a representative, which is something to keep in mind if you’re accustomed to a brick-and-mortar bank. Sallie Mae Bank positions itself as the place to save for college, and the company does follow through with a number of options for parents as well as young adults. The 529 plan may be the ideal option for parents looking to save money in a tax-advantaged way. It can help grow money for future college expenses in an economical manner. And for those looking to use a savings product, Sallie Mae offers many different options depending on your financial situation, all with no fees, minimum deposits or account balances. If you’re looking for the best rates, you may want to go with a money market account. Sallie Mae offers better interest rates for this option, and unlike a CD, your money will be accessible at any time. It is important to note that interest rates can change at any time, so it’s something to keep in mind when choosing which bank and which type of account to open.